I suppose this entry is a mixture of things. First of all, I somehow got inspired to go to the Music Library and photocopy a bunch of sheet music by Erik Satie. Specifically, the music in question is his series of Gnossiennes, written around the turn of the century. There are six of them all, and as I remember, I know how to play the first four of them, and I was working on the last two pieces, when things didn't work out with me and the music scene. So I once again decided to work on them, and I photocopied all six scores just a few hours ago, and went to my practice room and worked on it. I was glad that I still had it in my hands to play the first four without stumbling badly. So there, Erik Satie is back in my working repertoire. Wow. The folder containing all of my photocopied music is slowly getting thick. I finished reading the novel entitled Ghost. I loved it. The main character David, sees something, maybe a ghost, maybe something else, in the slumber room of the funeral home that he works in. The novel doesn't actually tell the reader what David saw, so both sides took the whole book in arguing what that actually was. People who believed in the supernatural courted David into joining some nutcase Second World Society, while people who were skeptics such as the scientific university community went ahead and dismissed the events. It was a hilarious, yet very interesting book. 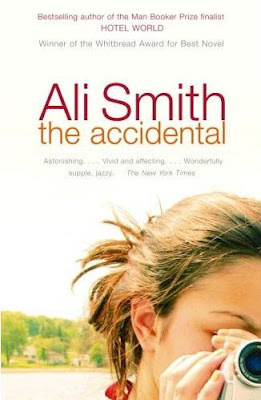 So there, I returned that book to the library, and started working on this new book, entitled The Accidental, by Ali Smith. It supposedly is about a stranger in a town in England. How it goes I don't know yet, I just started it, but I will review it once I finish it, as usual. The sky is so clear at the moment, and I take that as a sign that it must be very cold outside. Winter is back, and I suppose it is again the time for long coats and gloves.